Compensates for age-related enzyme deficiencies. Improves absorption of fats, protein and all dietary energy sources in vulnerable individuals. 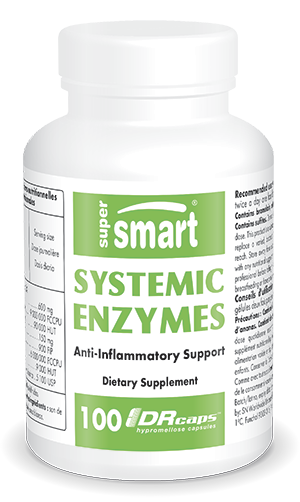 Systemic Enzymes contains systemic enzymes that split proteins into shorter amino acid chains, thus conferring multiple health benefits, including soothing and purifying effects. An enzyme is a biological catalyst, a molecule that increases by up to several million the speed at which metabolic reactions take place in cellular and extracellular environments. Almost 3000 enzymes generate over 7000 enzymatic reactions in the body. Enzymes are particularly associated with, but not limited to, digestive function. “Systemic” means that they act throughout the body, providing multiple benefits for human health. • Peptidases break proteins’ peptide bonds, and participate in protein maturation, food digestion, blood coagulation and tissue remodelling during the body’s development and healing processes. • Chymotrypsin and trypsin hydrolyse the majority of proteins and work synergistically with endogenous enzymes. They boost digestion, the immune system and cardiovascular health. • Pancreatin is a mixture of several digestive enzymes produced by the pancreas (amylase, lipase and protease) which helps in treating certain food allergies and auto-immune diseases as well as in losing weight. • Bromelain and papain are plant proteolytic enzymes. Bromelain is recognised for its ability to reduce inflammation and swelling. Papain is also used to counter plaque, treat oedema and inflammatory processes as well as to reduce post-operative swelling and adhesions. • stimulate drug efficacy (particularly chemotherapy). • in pancreatitis, inducing moderate secretion of enzymes ; • in chemotherapy, improving its effects. As enzymes are vulnerable to degradation by stomach acids, Systemic Enzymes now comes in DR Caps™ - gastro-resistant capsules - which ensure optimum efficacy and bioavailability, the enzymes being absorbed in the small intestine where they pass directly into the bloodstream. Other ingredients : Rice bran. Adults. Take three capsules twice a day one hour before meals. Higher doses may be taken on the advice of your therapist. Contains bromelain, extracted from pineapples. Contains sulfites.